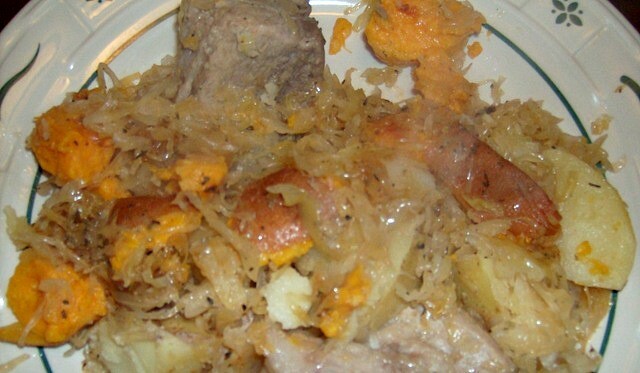 I combined elements of two of my favorite pork and sauerkraut recipes, impulsively added sweet potatoes and in the process created a new family favorite. While the meat is browning, I chop the vegetables. After the meat is browned, put it in the pressure cooker ( I actually brown my meat in the pressure cooker with the rack removed. Then I put the rack in and place the meat on top of it, so the liquids can circulate on all sides of the meat. Pour the sauerkraut and water over the meat and potatoes. Add the brown sugar, catsup, and spices. Put the lid on the pressure cooker. Cook over high heat and bring it to high pressure. Adjust heat to keep it at high pressure and cook for ten minutes. Remove from heat, place pressure cooker in the sink and run cool water over it until all pressure has been released. Remove lid, with the pot tilted away from you, in case more steam escapes. My camera acted whacky and I only have a partial picture of my son's plate, heaped high in a disorganized manner with pork, sauerkraut, and sweet potatoes. It doesn’t look very appetizing, but oh, was it good. We really liked the addition of sweet potatoes. This is a quick and easy pressure cooker meal. Place the rack in the bottom of the pressure cooker. Place meat on top of rack. Add veggies. Pour sauerkraut over the top of the veggies. In a small bowl, combine water, sugar, catsup, and spices. Pour over the top of the sauerkraut. Place the lid on the pressure cooker. Cook over high heat and bring it to high pressure. Adjust heat to keep it at high pressure and cook for ten minutes. Remove from heat, place pressure cooker in the sink and run cool water over it until all pressure has been released. Remove lid, with the pot tilted away from you, in case more steam escapes. Direction for cooking in a Dutch Oven: Brown meat. While the meat is browning, chop the vegetables. After the meat is browned, put it in the Dutch oven. Add potatoes and onion. Pour sauerkraut and water over the meat and potatoes. Mix in brown sugar, catsup, and spices. 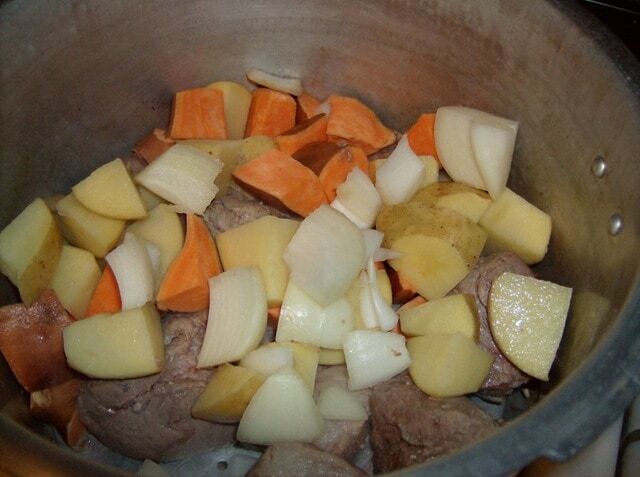 Cover with lid and cook at 350 degrees for 2 hours or until meat is cooked through and potatoes are fork tender. Ok now that is definitely different. I have never heard of that. Mub, I love cooking in a pressure cooker. I can have a real meal on the table in under 20 minutes. 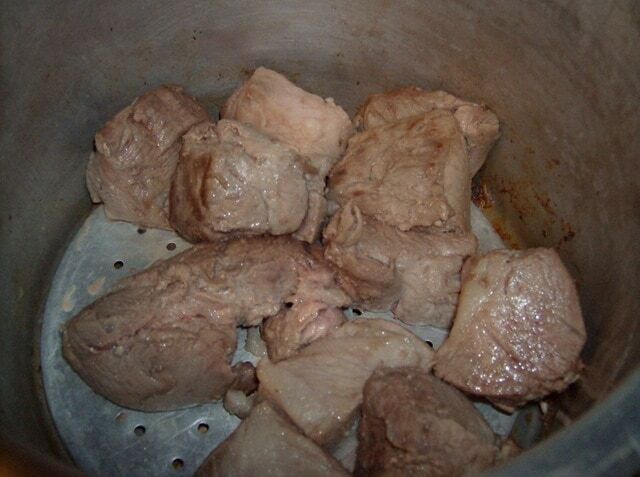 Cooking in a pressure cooker also creates fork tender meat form the roughest cuts. Thanks for the link! This sounds wonderful. I really like that it is so easy to do. It's a perfect winter meal. I was just reading yesterday how sauerkraut is good for you, so this is a fun recipe to come upon. It is going in my recipe box. Thanks! Adding this one to my list of new recipes to try next week! Thanks! I don't think my kids have ever eaten sauerkraut, and I haven't had it in years. I really need to give it a try again, and at least give them the experience of trying it. Thanks for participating in "What can I eat that's gluten free?" I just received a side of pork. I was wondering what I was going to do with it all. This is most definitely on the the list! Thank you for sharing such a great post! This looks great! Thanks for sharing this for WCW. sounds yummy…. different so I will have to give it a try. You know, I wasn't sure I liked the sound of this, but the photo looks so yummy! I bet the guys love it. I use yams/sweet potatoes too, as I am also sensitive to potatoes. Funny, I just made my own version of exactly this same meal tonight for dinner, except I put Dijon and stone ground mustard in with the sauerkraut instead of ketchup. I was googling around for help on a cook time for my instant pot pressure cooker and ran into your recipe. I can’t wait to try it. I love pressure cooking! Love this idea! I haven’t made it yet but will soon try it. My mother was a bit of Austrian/Polish and made a wonderful pork & sauerkraut, she used Thyme in her recipe & ‘always’ kidded us kids, you better like this & eat alot, I hope you appreciate all the thyme & effort I put into dinner! Then my mother in law was German/Hungarian & I have to say, made the best Sake goulyas (?german spelling?) My kids are 40 & 37 & still ask me to make it for them, & extra so they can take home leftovers!